Home > News > Why do we provide bikes to refugees? Houston’s most recent arrivals include people from the Democratic Republic of the Congo, Afghanistan, Myanmar and South Sudan–people who have come to build a safe, new life for their families. Abdul is an electrical engineer who fled Afghanistan with his wife and daughter and came to Houston in Spring 2016 to build a safe, new life for his family. Abdul, got a job, enrolled in classes to become a master electrician and uses a bike from Freewheels Houston to go to his classes, get to his job with a construction company and shop. In Houston, he says, people are friendly, but the weather is often too hot and humid. Isaac and his family came to Houston from a refugee camp in Tanzania, after fleeing civil war in the Democratic Republic of the Congo. His Freewheels Houston bicycle shortens the time required for his three-mile trek to Westbury High School, where he’s enjoying science and government classes. 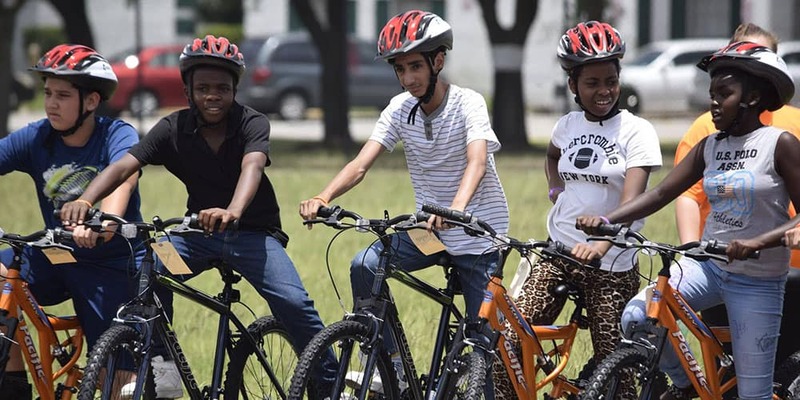 Freewheels Houston was established to provide bicycles for refugees as they begin their new lives in Houston. Refugee families want the same things as others in Houston: Safety, opportunities to provide for their families and the hope that their children will be happy and succeed. Bicycles help them achieve their goals by enabling them to get to work and go to school. Nearly a quarter of the Houston-area population was born in another country, a 59-percent increase since 2000. More than 100,000 foreign-born residents are entrepreneurs, according to a study released in August 2016 by the Partnership for a New American Economy. Refugees have contributed to the Houston economy for 40 years, with the first wave of Vietnamese immigrants, and now number 70,000 in our community. In the fiscal year that ended Sept. 30, 2017, approximately 2,000 refugees resettled in Houston as well as many people who worked for the U.S. armed forces in Afghanistan and Iraq and were forced to seek refuge from continuing violence. The movement of people fleeing war and persecution is a global crisis. The United Nations High Commissioner for Refugees estimated that 65.6 million people were forcibly displaced at the end of 2016 and 21 million of them were forced to flee their home country. Most live in camps in adjacent countries, but many have fled to Europe. The United States resettled 50,000 refugees in the fiscal year that ended Sept. 30, 2017, and about 2,800 made their way to Texas (down about 65 percent from 2016). Five resettlement agencies work with refugees resettling in Houston and they are supported by other nonprofit agencies, school districts, public health agencies, churches and other faith communities and hundreds of volunteers. Freewheels Houston is pleased to be a part of this network that welcomes refugees and helps them contribute to the vitality of our community.